We live among rolling fields fenced by stone walls and old sugar maple trees. In October the air shimmers with misty hues of red, orange and gold. The air is crisp and clear, but still retains a certain warmth. Old logging roads and wooden paths beckon you along their winding way enticing you with what may be hidden just around the corner. Ducks and geese call to each other as they fly by on their way to warmer climates. Days are shorter and nights are cooler making for perfect cooking weather, for this is harvest season and fresh food abounds. In the evenings, you may catch the hint of wood smoke in the air coming from a chimney or two, as families sit by the fire chasing off the slight evening chill. Just one month later the vision is drastically different. November brings shorter days, cooler temperatures and that hint of snow in the air. The only leaves left on the trees are brown and dried. Forests now reveal hidden stories that were once concealed by fresh green leaves. The skies are a cold steel gray most of the time, but even the sunny days do not bring much warmth. The only sound you hear is the howl of the wind, which can bite right through you. If it wasn’t for Thanksgiving, November would be a very bleak month indeed. While it can snow here in November, it often just threatens to, spitting down a flake here or there almost as a tease to those hardy skiers. By now, most people have their homes winterized, wood stoves are going strong and anything related to summer has been stowed away until next year. What we eat and how we cook changes drastically. Outdoor grills are replaced with indoor crockpots. Fresh vine vegetables have been canned or frozen and now replaced with heartier squashes and root vegetables. Instead of meandering down wooden paths and taking in the beautiful scenery of October, we now stay indoors, watch football and keep a look out for that ever promised snow so winter sports can begin. Despite November’s dreary appeal, it has its place on the seasonal calendar. We become so enamored with October that we might well forget that winter is just around the corner. November is here to remind us. She is stern and unforgiving, raw and cold, but there is beauty in her starkness. Because of her, we give ourselves permission to stay indoors wrapped in a warm blanket with a good book and a hot beverage. As we come up to Thanksgiving and we look for things to be thankful for, perhaps we should be thankful for the month of November. After a hectic summer cramming every outdoor activity possible into a few short months, November allows us to slow down, take a breath and rest a while. It’s that deep inhale and exhale before the holiday season begins and the craziness jumps into full gear. This seasonal break between summer and holidays doesn’t last long up hear in the north. Give yourself permission to take a few moments to just breathe. Now is a great time to refresh yourself. It is also a good time to take a look at the world around us and appreciate it for what it is. Not dressed in her seasonal best, we should accept nature at her worst when all her scars are bared to us and she prepares to blanket herself in snow. 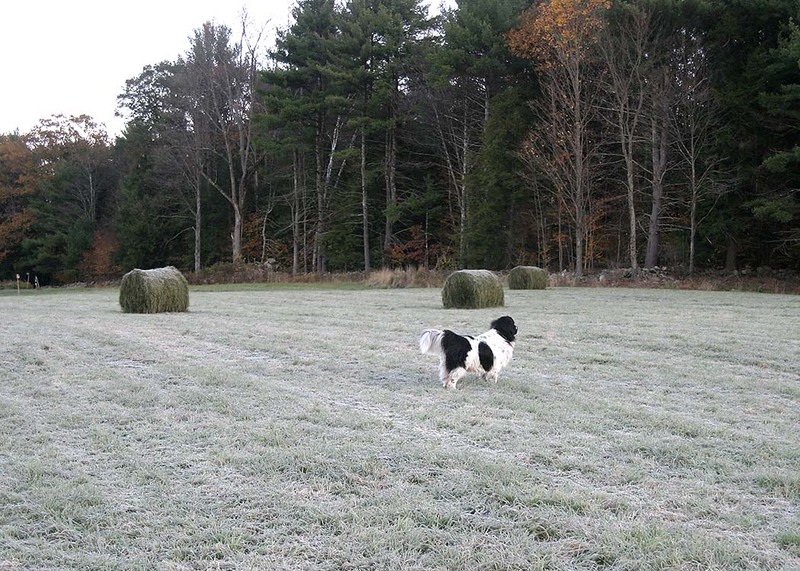 Our Newfoundland, Elli, checking out the field after a November frost. November here is not as cold but the drizzly rain and grey skies have been keeping me inside. Perhaps I should appreciate that more and moan about it less.